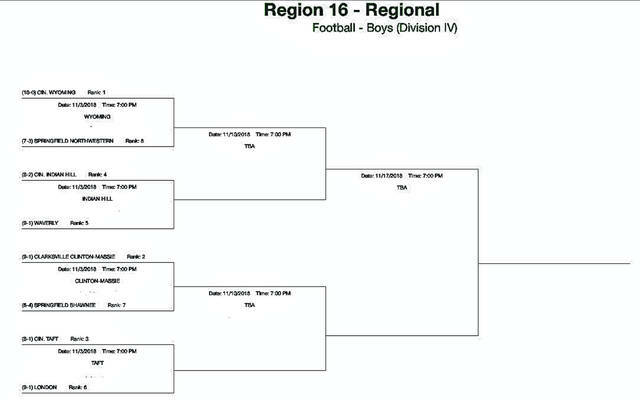 The OHSAA Region 16 bracket football bracket. 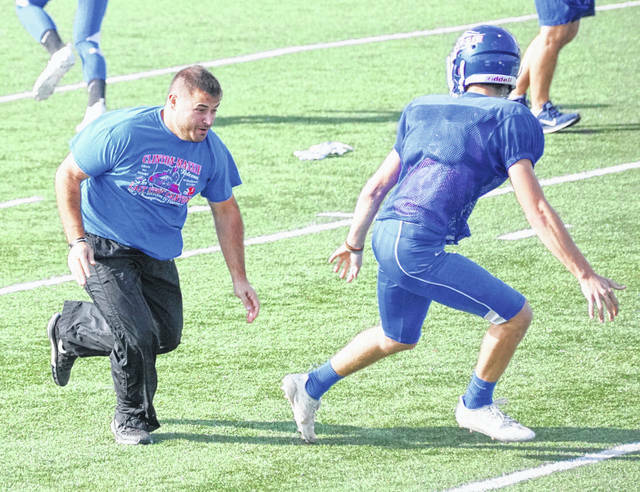 Coach Jordan Phipps (left) works on special teams with the Falcons Tuesday afternoon at Frank M. Irelan Field. In a feel-good story regardless of your team affiliation, the Springfield Shawnee Braves advanced to the playoffs with their victory last week over Plain City Jonathan Alder. The twist with the Shawnee 17-14 victory over the Pioneers was the winning field goal was made by the head coach’s daughter, Andi Meeks. The Braves will come south to Frank M. Irelan Field to face Clinton-Massie 7 p.m. Saturday in a Division IV Region 16 matchup. Clinton-Massie faced Shawnee in 2017 (winning 30-7) and 2016 (winning 36-0). Both games were in the regular season. Presale tickets for the game are on sale now. Tickets are available until 3 p.m. Friday at the Clinton-Massie central office and until 9 a.m. Friday at the 73 Grill restaurant. Presale tickets are $8. Tickets at the gate are $9. Parking is $3. Gates open at 5:30 p.m. The Braves finished the season with a 6-4 record and earned the No. 7 seed. Clinton-Massie is 9-1 and is the No. 2 seed. An unbeaten and dominant Cincinnati Wyoming squad is 10-0 and is the top seed in the eight-team Region 16 bracket. The Braves run a spread offense but rather than throw the ball they are a running team. The quarterback situation for Shawnee is up in the air. Last week Robie Glass left the win over Alder in the third period with an apparent injury. Drew Mitch led the team to the win. Glass threw for 1,137 yards and nine touchdowns while running for a team-high 998 yards and 11 scores. In limited time at QB, Mitch threw for 216 yards and two TDs while running for just 76 yards (14 carries) and one touchdown. In all, the Braves ran for 1,881 yards and 28 touchdowns. The Falcons, on the other hand, rushed 484 times for 3,853 yards and 52 touchdowns. Brendan Lamb was the top rusher, gaining 1,010 yards and 11 touchdowns but Corey Stulz, Jake Vaughan, Robby Frederick and Daulton Wolfe combined for 2,144 yards and 29 scores. Lamb missed time with an injury but the Falcons didn’t miss a beat. Last season, CM was without top rusher Christian Poynter and didn’t seem to be as effective in the ground game. “They will give multiple (defensive) alignments and a lot of movement to try and confuse us up front,” said Zantene. Tasked with stopping the Braves high-powered offense will be a Massie defense that has been tough all season, allowing just 96 points during the 10-game regular season slate. Massie’s lone loss was to Coldwater, the No. 1 team in the Region 24 bracket. “I think our kids and coaches learned a lot from that game and were able to put ourselves in a better position on the field because of it,” said Zantene. Linebacker Tyler Beam led the Falcons with 60 tackles this season while Griffin Laake had 57 tackles and two interceptions from his secondary post. Thomas Myers had 54 tackles at the defensive end position. Garrett Trampler led the Falcons with three interceptions; Nathan Allgeyer and Corey May also had two picks. • HOMETOWN TIES: Among the 32 teams in the four Div. IV regions, Springfield Northwestern is the only first-time playoff participant. The top player on the team is senior Eli Berner, who is the son of Jennifer Bryant Berner, a Wilmington High School graduate. Berner has rushed for 1,286 yards and 13 touchdowns this season while catching 17 passes for 262 yards and two more scores. Northwestern is the No. 8 seed and will play at Wyoming Saturday night. • In 18 years in the post-season, Clinton-Massie is 31-15. Only Steubenville in Region 13 has more post-season wins (66-26) among Div. IV schools in this year’s playoffs. https://www.wnewsj.com/wp-content/uploads/sites/22/2018/10/web1_FB11_cmbracket2018.jpgThe OHSAA Region 16 bracket football bracket.